The Great Lakes Institute of Management, Chennai, celebrated SWIM (Successful Women in Management) on 12th August 2008. SWIM is an initiative mooted by the students of Great Lakes Institute to empower women with strong traits to assume leadership roles in the corporate world. The day-long event was organized at Hotel Green Park. 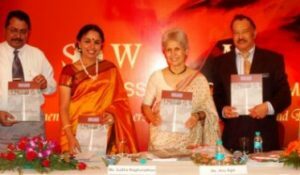 Anu Aga, Former Chairperson of Thermax presided over the event. Sudha Ragunathan, Mridula Ramesh of Sundaram Textiles and Hemu Ramaiah, founder of Landmark, enlightened the audience speaking on “Women as Trail-blazers: Dreaming, Exploring & Discovering New Horizons”. In the early and quiet morning of 8th August 2008, the ‘Power of Silence’ was unleashed. Sudha, along with other dignitaries and the Mayor of Chennai, assembled at the Marina Beach, Chennai and observed 8 minutes of silence from 08:00:08 am to 08:08:08 am, listening only to the sounds of nature. This event was organized by the Global Carnatic Music Association in collaboration with Sri Krishna Sweets and Exnora International, in a move to bring in an awakening on the effects of global warming. This was a prelude to the grand finale of the ‘88888 lights out campaign’ at 8 p.m. at Arihant Towers in Koyembedu.